Read eBooks online | World Heritage Encyclopedia | Origin of the name "Empire State"
The U.S. State of New York has been known by many nicknames, the most notable of which is The Empire State. Adopted as late as the 19th century, the nickname has been incorporated into the names of several state buildings and events. It is commonly believed to refer to the state's wealth and resources; however, the true origin of the term is unclear. There are several theories on the origin of the name. Two of them involve Virginia in population. None have been proven true. The more commonly accepted tale says that when Washington was given a full map of New York prior to the Battle of New York, he remarked New York's natural geographic advantages, proclaiming that New York was the "Seat of an Empire." The origin of the term has puzzled many historians; as American writer Paul Eldridge put it, "Who was the merry wag who crowned the State ... [as the Empire State]? New York would certainly raise a monument to his memory, but he made his grandiose gesture and vanished forever." The source of the term "Empire State" is uncertain. It has been attributed to the state's wealth and resources, but there is some doubt regarding that. Two possible stories involve America's first George Washington. Alexander Flick, in his History of New York State, claims the title was used as early as 1819, coinciding with New York surpassing Virginia in population. He did not provide any source for this claim. Further in his book, Flick adds that the term was "universally acknowledged and accepted" by the time the Erie Canal was completed in 1825. In a later work, Flick and coauthor John Jacob Anderson claim "New York is well called the Empire State ... not only because of the vastness of its resources, but because it so conspicuously illustrates the imperial power of law-abiding liberty among the people." Milton Klein, in The Empire State: A History of New York, proposes that the name may have accompanied the success of the Black Ball Line in 1818 "because of the signal advantage the regularity of shipping gave to New York's merchants over those in other coastal cities." He claims that by 1820, it was clear that "Empire State" was in wide use, though he is doubtful that a clear origin of the term will ever be determined. The 1940 Guide to the Empire State included the following quotation: "...it would gratify the people of New York if they could discover who first dared that spacious adjective." 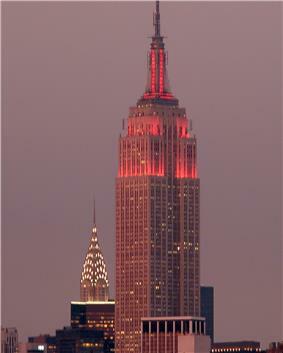 The Empire State Building (1931) is the best-known application of the nickname. The Empire State Plaza (constructed 1959–1976) houses much of New York State government. New York is widely known by the nickname "Empire State", and its effects can be seen throughout the state. Manhattan's Empire State Building, which opened in 1931, was the world's tallest building until the completion of the north tower of the World Trade Center in 1970. Following the September 11 attacks, the Empire State Building once again became the tallest building in Manhattan until One World Trade Center claimed the title in April 2012. 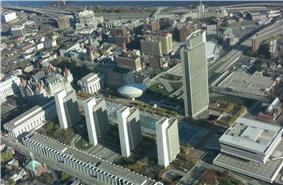 The main offices of state government are located at the Empire State Plaza (ESP) in Albany, the state capital. Its most iconic structure, the Erastus Corning Tower, is the tallest building in New York outside of New York City. The nickname has also been used for train routes: the Empire State Express, of the New York Central Railroad, was established in 1891, and Amtrak currently offers its Empire Service from New York City to Buffalo via Albany. SUNY Empire State College, established in 1971 in Saratoga Springs, also makes use of the name. The Empire State Games, established in 1978, is an Olympic-style competition for amateur athletes from New York. Additionally, the term "Empire State" has been included on New York State license plates since 2001. In 2009 Jay-Z and Alicia Keys released the 5x-platinum single "Empire State of Mind." ^ Shearer, Benjamin; Barbara S. Shearer (2002). State Names, Seals, Flags, and Symbols: A Historical Guide (3rd ed.). Westport, CT: Greenwood Press. p. 9. ^ Anderson, John Jacob; Alexander Clarence Flick (1902). A Short History of the State of New York. New York, NY: Maynard, Merrill, & Co. p. 321. ^ Berman, John S. (2003). The Empire State Building. New York, NY: Barnes and Noble Publishing, Inc. p. 9. ^ Dunlap, David (2012-04-29). "With a Steel Column, a Tower Will Reclaim the Manhattan Sky". The New York Times (The New York Times Company). Retrieved 2012-05-09. ^ Waite, Diana S. (1993). Albany Architecture: A Guide to the City. Albany, NY: Mount Ida Press. pp. 81–82. ^ "About Us". Empire State College. Retrieved 2010-09-20. ^ "About the Games". Empire State Games. Archived from the original on 2010-09-12. Retrieved 2010-09-20. ; Note that as of 2011, the games have been halted due to budget constraints. ^ Swearingen, Jacquelyn (2001-01-02). "Lady Liberty's License Plate Number Is Up".